Courtesy FoodOnTheTable.comA savory cherry sauce tops seared and baked pork chops with this seasonal summer recipe. Summer doesnand#8217;t feel official without digging into a large bowl of shiny, sweet cherries. Cherry season is the highlight of the year for many, but with a short season, June through August, donand#8217;t let summer pass by without enjoying a taste of natureand#8217;s candy! Cherries are a stone fruit, which means their soft flesh surrounds a hard center seed, called a pit. Cherries are a member of the rose family and a relative to other stone fruits, such as peaches, plums and apricots. There are hundreds of varieties of cherries available worldwide, all ranging in size, color and flavor. Cherry color ranges from a yellowish-pink to bright red to a deep black; with their size ranging from half an inch to well over an inch. With all the varieties of cherries available, there are only two common cherry species: sweet and sour. The sweet varieties of cherries are the most common and include Bing and Rainier cherries. Sour cherries, sometimes called tart or pie cherries, include Montmorency and Morello cherries. Cherries are low in fat and calories and high in fiber. They are an excellent source of vitamins A and C, potassium, and powerful antioxidants that have been shown to provide anti-inflammatory benefits. Fresh cherries should be stored whole, unwashed, in a plastic bag in the refrigerator. If stored properly, cherries should last for about a week. Cherries are a delicious fruit that can be enjoyed all on their own, baked into desserts, added to salads, or transformed into beautiful sauces perfect for everything from cheesecake to chicken. To use, remove the stems and pit. This can be done using a cherry pitter or even a decorating piping tip. But use caution, as that bold cherry juice can stain fabrics, countertops, and fingertips. With cherry season winding down, be sure a gobble up as many cherries as possible over the next few weeks. 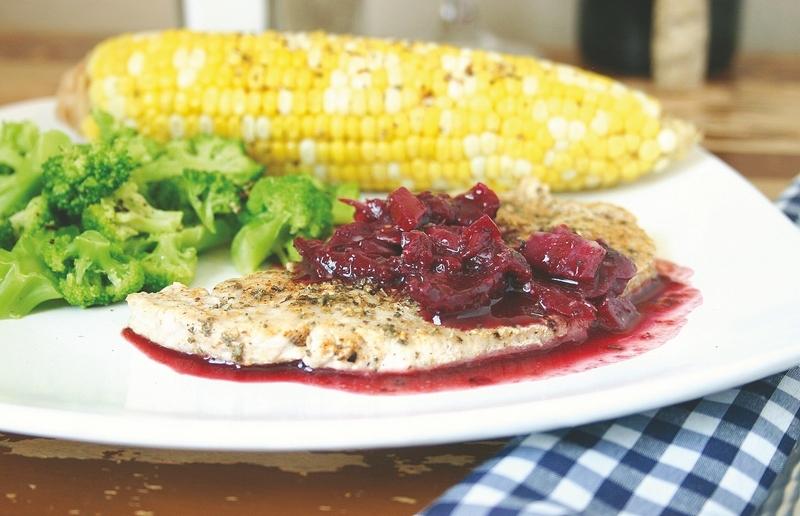 This pork chop dinner has a luscious balance of sweet, tart, and savory flavor profiles; perfect for an end of summer meal! Heat 2 tablespoons butter in a large skillet over medium-high heat. Season the pork chops with salt and pepper, then brown in the hot oil until golden brown on both sides, about 2 minutes per side. Remove the pork chops to the lined baking sheet. Bake in the preheated oven until the pork chops are no longer pink in the center, and register 160 degrees F (71 degrees C) on a kitchen thermometer, about 20 minutes. and#8212; Chef Heather Hunsaker attended and graduated from Le Cordon Bleu College of Culinary Arts, but has been developing family friendly meals since she was nine years old in her motherand#8217;s kitchen. She knows how to get food on the table in a pinch while sticking to a budget. Chef Heather serves as a freelance writer and recipe developer for meal planning site http://www.foodonthetable.com.